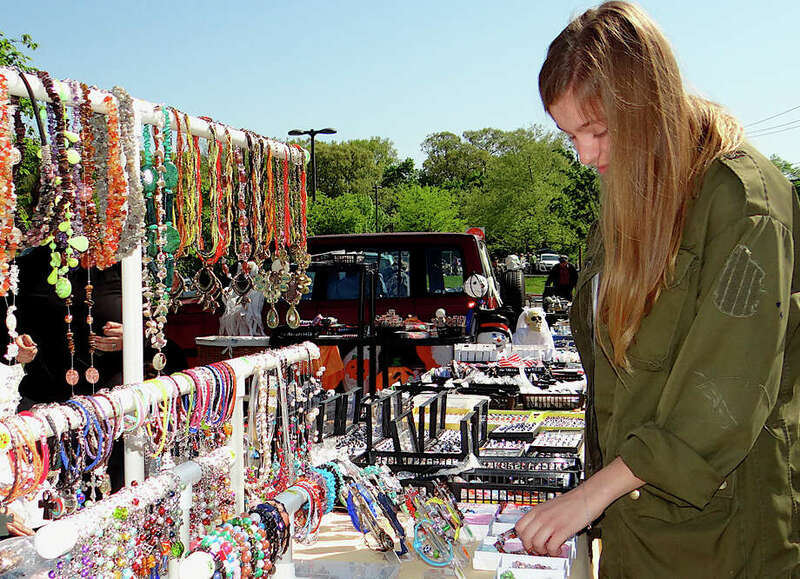 Diana Brisca of Fairfield browses through jewelry at Fairfield Warde High School PTA's outdoor flea market Sunday. Treasures big and small were in great abundance Sunday at Fairfield Warde High School as the school's PTA kicked off its season-long series of monthly outdoor flea markets. Held in the school parking lot at Melville Avenue and Knapps Highway, the sale featured more than 80 vendors -- a record -- according to Michele Modugno, the PTA secretary. Rental fees collected from the vendors ;help support various programs the PTA provides to students and that recognize teachers. There was something for everyone, including clothing, tools, antiques, books, collectibles, furniture, glassware, jewelry, CDs and records, plants, coins, toys and artwork. Food trucks catered to a range of visitors' tastes. The remaining flea market dates for the summer are June 22, July 20, Aug. 17 and Sept. 21, from 8 a.m. to 3 p.m. each day.